please help this is magnus, sculpture studio group two… it seems we have misplaced our contextual awareness and are adrift, lost in the contemporary post-modern reality. kim is stuck in a fetal position in the shower, i can hear his screams; “i need to go deeper”! the lights went out days ago, we’re running out of ideas. kjersti is raving on about clouds, “the cloud”, and membranous tissues. flo is trying to make a robot that pulls things. anton is nowhere to be found. i think there’s something on the roof, i can hear it lumbering around slowly, endlessly referencing philosophy. i’m afraid and i don’t know what to do apart from blogging about it on the post-internet. i tried to make a gif about it but nobody’s sharing. my website isn’t simple enough, there’s too much flair. i need hype. everyone is doing their own thing and we’re running out of time. maybe if there was a way to work together, put our heads together and find some common ground? 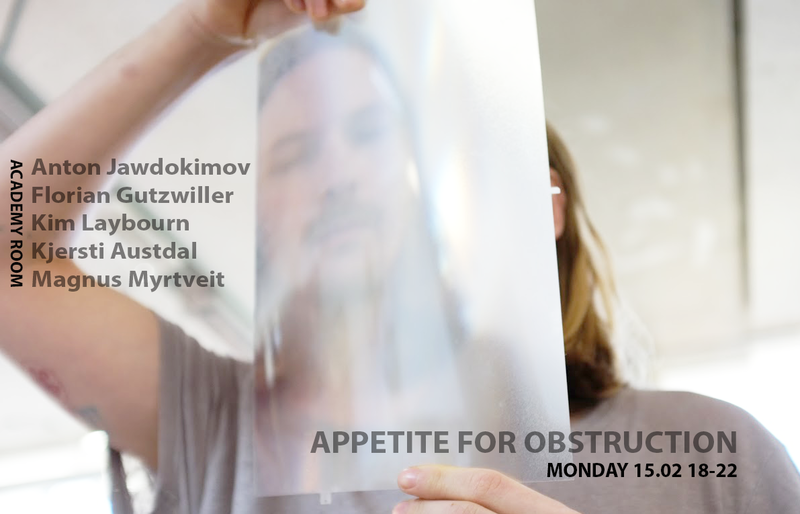 an appetite for obstruction, to dull the ego somehow… here’s a show about that.